I have been a fan of Ubisoft’s acclaimed Assassin’s Creed series since its inception. I was always drawn to the franchise’s unique combination of historical fantasy, science fiction, groundbreaking graphics, detailed world-building, and immaculate soundscapes. 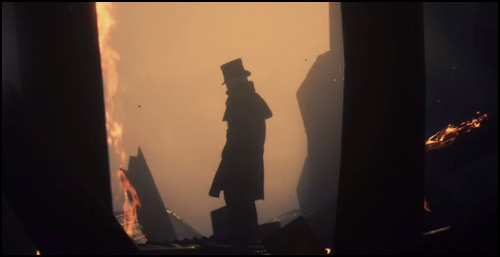 Of course, I was thrilled at the opportunity to compose the original score for the Jack the Ripper downloadable content for the new Assassin’s Creed game. Collaborating with the team at Ubisoft was every bit as rewarding and exciting as I had imagined, and the end result yielded one of the most intense, mysterious, and vicious scores I’ve ever composed. I was so excited about it, I partnered with Ubisoft to release the soundtrack album, coming to your favorite digital retailers on December 15th, and already available for pre-order from iTunes, Amazon, Apple Music, and Spotify. 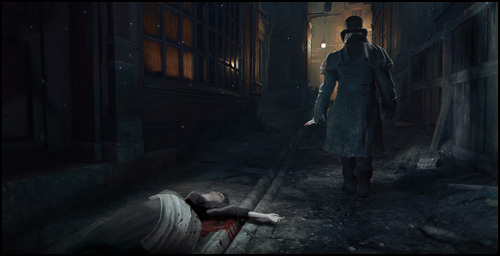 The story of Jack the Ripper fits firmly in the psychological thriller and horror genres, giving it a much darker and more grisly tone than any previous entry in the Assassin’s Creed franchise. The producers and I decided from the beginning that the score would require a variety of themes to help guide the player through the tale. No “spoiler alert” is needed to say that Jack the Ripper factors into this story in a big way. So, it was clear from the start I would be writing a theme for Jack the Ripper. I was very excited at this prospect. Having worked on Da Vinci’s Demons, Black Sails and Outlander, I have had several opportunities to write themes for characters based on real historical figures, and I always find the experience inspiring. The histories and mythologies of the real people bring new layers to their on-screen portrayals, and inspire my music in new ways. Thinking about the mystery and horror of Jack, my imagination immediately went to percussive stringed instruments: pianos, harpsichords and hammered dulcimers. I detuned each instrument to varying degrees, so that the combined result would be rich with oscillating waveforms clashing against one other. In my experience, notes that are slightly out of tune are more disturbing and exciting than ones that are extremely out of tune. I also bashed a piano with mallets, scraped strings, and inflicted mayhem on these poor instruments. These techniques created a signature color palette that I could draw from to instantly evoke the presence of Jack the Ripper. This was my musical representation of brutal power and insanity. Jack’s theme is simple, more like an ostinato than a melody. In fact, I frequent repeat it over and over, turning it into a creepy background pattern, but it has enough distinct melodic content that I hope it stands out as a primary theme. Like many of my villainous themes, its melodic construction is circular and repetitive. I always feel that large intervallic leaps and soaring long notes imply heroism and nobility. Shorter notes that wind around condensed intervals tend to imply a more sinister, focused, and less emotional character. The jagged, repetitive nature of the notes almost feels like a knife slashing toward you. There is absolutely nothing elegant about this theme at all. When played on the detuned string instruments, it is, in my opinion, a perfectly appropriate audio representation of an insane serial killer going berserk. To hear Jack’s Theme in action, check out tracks 1 and 5 from the soundtrack album. Creating the signature slashing musical texture for Jack was not my only musical task. I also needed to write a theme for the primary playable character, Evie Frye. Evie brought an entirely different set of influences to my work. 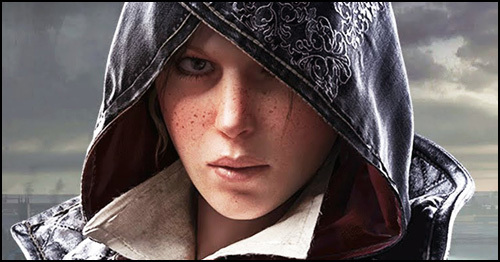 Picking up from her role in Assassin’s Creed Syndicate, Evie begins this game having lived in India. The producers and I were excited about letting this exotic location be a presence in the score. While the players never directly experience India, the score brings layers of that exoticism to the foggy streets of London, giving Evie a unique tonal identity. Evie’s Theme is the opposite of Jack’s in nearly every conceivable way. It is elegant where Jack’s is chaotic, lyrical where his is repetitive, harmonic where his is detuned and atonal. I represented Evie with a unique instrumental color that calls back to her past living in India. When one thinks of Indian music, two instruments immediately come to mind: tabla and sitar. Tabla was an easy and obvious addition. The unique round deep tones of the larger drum, and the slapping peaks of the smaller drum blended perfectly with the percussive elements of Jack’s Theme. For a melodic instrument, however, I found that the sitar simply lacks the kind of expression I needed for Evie’s Theme to hold its own against Jack’s Theme. I took my inspiration from the overtones of the sitar, but crafted a new sound by pairing two unusual instruments together: the cello and the yialli tanbur. The yialli tanbur hails from Turkey, and is a sound I have featured prominently on several scores, most recently on the third season of Da Vinci’s Demons. For Jack the Ripper, I put the tanbur player and the cellist in a room together, sitting side by side, and asked them to play her theme together, simultaneously. This approach created a logistical challenge. The tanbur is a microtonal instrument, with many notes on its neck that are in between notes on the cello. By pairing them together, I effectively pushed each player out of their comfort zone: the cellist had to bend pitches into microtones, and the tanbur player had to really stretch to get the instrument to lock into Western tuning. Each player learned to play along with the other, and a unique tone was born. I can’t say the session was easy. The first hour was pretty much a bust, spent simply trying to get the instruments to tune to one another, and figuring out how to best place the microphones. After a few hours, however, their hands and minds melded into one and the distinct tones of the Evie Theme were born. At first listen, one might not think that the rich baritone expression of the cello and tanbur combination is an obvious fit for a female character, and yet I think the powerful sound perfectly captures her skill, personal background and character arc. Writing a theme for one of the first female playable characters in the history of Assassin’s Creed was something I took very seriously, and I am very happy with the result. For the best example of Evie’s Theme, check out tracks 1 & 2 from the soundtrack album. This theme is simpler, usually featuring solo piano or the small string ensemble. The purpose of this theme was to evoke the melancholy of a foggy London winter. It represents the darker moments of suspense and mystery that define the gamer’s experience. This theme is featured throughout the game, and plays a major role in the final narrative cinematic. The final theme of the game is for Fear itself, a concept that nearly becomes a character in its own right. The team at Ubisoft had a very cool idea that this theme would live somewhere between sound effects and music. I had lengthy discussions with them about this concept, and I’ll admit it was the toughest for me to wrap my head around. We started with the idea of a heartbeat sound effect, and the sounds of blood pumping through veins. This sound effect is, of course, the quickest cinematic shorthand to communicate fear. But, we realized quickly that audiences are conditioned to think that the presence of a heartbeat sound effect in the soundtrack implies that the protagonist is the one experiencing the fear. In this case, the protagonist (the player) is the one causing fear in others. So, the heartbeat alone was actually working against our goal. Ubisoft gave me access to a ton of their sound effects and I began integrating them into musical tones. I used a heartbeat, yes, but also the sound of pumping water, rumbling engines and what sounded to me like a dragon breathing fire! I hammered all these elements into a musical rhythm that would live in perfect synchronicity with Evie’s Theme and Jack’s Theme. We ultimately found a perfect balance between score and sound effects, where they merged into a distinct tone that weaves its way through the gamer’s experience. To hear the Fear Theme in detail, check out the middle section of track 5 on the soundtrack album. 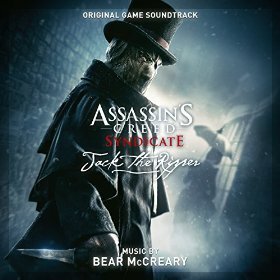 Assassin’s Creed Syndicate – Jack the Ripper was a thrilling opportunity for me to write some of the most insanely aggressive action music I’ve ever created, as well as work with new sounds that pushed my boundaries. I am also grateful for the chance to play around in a small corner of the expansive Assassin’s Creed universe, one that I’ve been a fan of for years. I’d like to thank everyone at Ubisoft for creating such a rewarding collaborative experience, especially Manu Bachet, whose insight and direction was invaluable. I’m thrilled that Ubisoft will be releasing my original soundtrack for Jack the Ripper, available from digital retailers on December 15th. It’s a short album, more like an EP, really. But, there is a lot of great music packed into these five tracks! I hope that my music helps contribute to a rewarding gaming experience, running through the foggy streets of London tracking down one of history’s most infamous killers. Enjoy!